The differences between an aerial lift and aerial scissor lift (and also a vertical scissor) lift aren’t great. That’s why so many people – aerial work platform (AWP) workers included – fail to recognize what makes each piece of equipment unique. CertifyMeOnline.net, the leader in AWP training, offers comprehensive training and OSHA certification for aerial lifts, aerial scissor lifts, boom lifts, vertical scissor lifts and much more. Sign up today and make sure your company is compliant with OSHA training requirements. So, when is a scissor lift not an aerial lift? Here, we set the record straight. Aerial lifts, or boom lifts, are classified as vehicle-mounted devices used to elevate personnel. They can lift workers both vertically and horizontally to reach exterior building structures, windows, trees, and power lines. They can be articulated to reach up and over structures, as well as access the top of roller coasters. 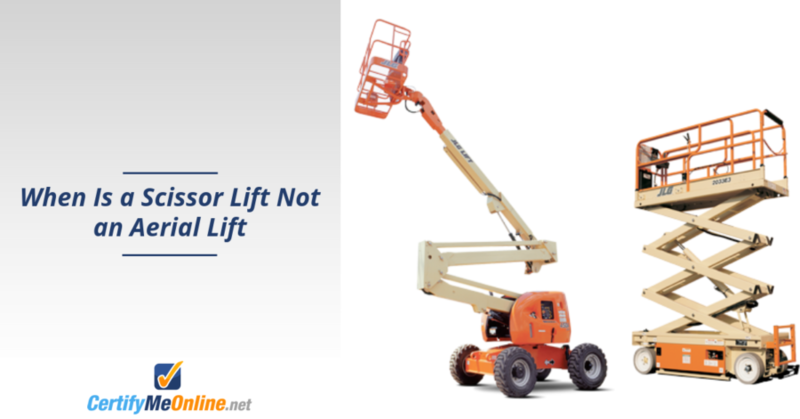 The difference between an aerial lift and a scissor lift is that scissor lifts can only extend horizontally, and do not have the same reach power. Think of aerial lifts as a more versatile elevated work platform. Aerial lifts, unlike aerial scissor lifts or vertical scissor lifts, are typically used outdoors. However, they’re also used in some indoor facilities, such as heavy equipment manufacturing centers. Scissor lifts do not fall within any of the above categories of aerial lifts, nor are there any OSHA provisions exclusive to scissor lifts. Scissor lifts do, however, meet the definition of a scaffold. Unfortunately, if you look at the general requirements for scaffolds (§1926.451), you won’t find scissor lifts mentioned. Anywhere on the page. Luckily, OSHA has made some improvements with their Scaffolding eTool. This page on the OSHA website makes it easier to understand what is a scissor lift and where it falls within the standards. It gives industry professionals some helpful background information on what makes a scissor lift, a scissor lift. According to OSHA, scissor lifts are “mobile supported scaffold work platforms used to safely move workers vertically and to different locations in a variety of industries including construction, retail, entertainment, and manufacturing.” Unlike aerial lifts, scissor lifts can only move vertically, directly above the base. It’s the recognizable crisscross style beams that move the lift platform straight up and down. All scissor lifts are considered scaffolding, whether it’s a vertical scissor lift or aerial scissor lift. Additional differences between what is a scissor lift and an aerial lift are the use of fall protection. OSHA requires that operators use body harnesses and lanyards on aerial lifts at all times, but these personal protection tools aren’t requirements for scissor lifts. As long as there are functioning guardrails present, scissor lift operators don’t need to wear harnesses while on the platform. This applies to aerial scissor lifts and vertical scissor lifts. What Does OSHA Have to Say? In September of 1999, a safety officer in Fredericktown, Ohio, wrote to OSHA with a simple question basically asking what is a scissor lift, and which OSHA standard covered scissor lifts with extensible platforms. The way OSHA responded to his letter may have you going around in circles, so just remember the stability triangle and you should be okay. Here goes. In 1997, OSHA issued Directive CPL 02-01-023, “Inspection procedures for Enforcing Subpart L, Scaffolds Used in Construction – 29 CFR 1926.450-454,” which, OSHA’s letter to the safety officer claims “erroneously stated that “scissor lifts are addressed by §1926.453,” which, just like the scaffolding document, makes no mention whatsoever of scissor lifts. That statement was then revoked by the very letter addressed to our man in Ohio, in which OSHA further declares that it is in the process of updating the 1997 Directive. The date of the letter was August 1, 2000. In the words of Chandler Bing, “Could the OSHA regulations on scissor lifts be more confusing?” If understanding OSHA’s scissor lift rules were a prerequisite to getting certified, there could be a problem. Fortunately, CertifyMeOnline knows exactly how to train and certify scissor lift operators. Our training courses are for all AWP workers. If your employees need OSHA certification for any of the following work platforms, contact us today! Wonder, “What is a scissor lift?” no more. We at CertifyMeOnline.net have made it our mission to understand all OSHA standards and regulations completely, so you don’t have to. Our scissor lift training program covers what is a scissor lift, how to operate the various types of scissor lifts, how to perform inspections, and how to recognize and avoid hazards. We cover all the necessary scissor lift topics to be 100% OSHA-compliant, fall protection, stabilization, and positioning for scissor lifts. To ensure students retain the information they learn, our program is self-paced and can be reviewed at any time. However, it typically takes trainees only about one hour to complete. And once they’ve worked through all the modules and have passed all quizzes and tests, students can print their operator certification card. OSHA compliance is mandatory. It’s illegal to have anyone operate a scissor lift or aerial lift without proper training. With CertifyMeOnline.net, we’ll take care of all your training needs. Plus, with refresher training, affordable prices and lifetime support, you’ll enjoy an OSHA compliance partner for life! Don’t be confused by scissor lifts and aerial lifts anymore. Learn from the number one online scissor lift training provider, CertifyMeOnline.net, and become a scissor lift expert.